Wise Anglers Follow the Birds! "Wise Anglers Follow the Birds!" 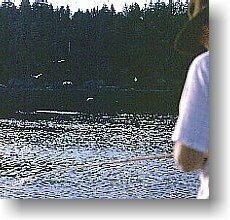 This classic tourism promotion phrase, "Follow the Birds," coined to bring visitors to coastal British Columbia, is one of the most important nature clues the sports fisher can heed. 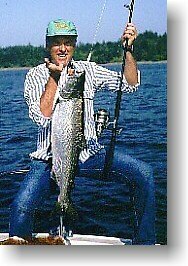 For the angler, searching for trout in one of B.C. 's 6000 lakes or, hunting for Pacific salmon in the more than 4500 miles of coastal ocean waters, bird excitement over these waters is a sure sign of underwater sports fish feeding activity. I like to classify salmon gulls on the ocean into two easy to observe groups; the large gulls and, the small or 'Coho' gulls. The latter group is by far the most important because, as the name implies, 'Coho gulls' focus on the fast moving, far ranging, surface fighting coho salmon. 'Coho gulls' belong to four basic species all of whom feed on surfacing herring or needlefish. These four species, the Bonaparte's Gull, Ross's Gull, Common Black-Headed Gull, and Terns are much easier to identify then the larger gulls. All four are slightly smaller than a crow with the mature Bonaparte's Gull easily distinguished from the others by its dominating black head. 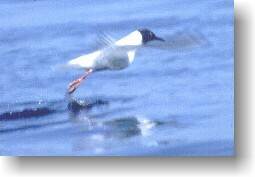 Terns are the easiest to identify by their streamlined shape and their feeding habit of dive bombing into surface bait, often from heights of from 20 to 50 feet. The other small gulls hover over bait schools only a few inches from the surface, dipping and diving as they select individual herring. What is important about these small gulls is the fact that they target young-of-the-year baitfish, species like herring and needlefish which are the primary feed of coho salmon. But, even more important to the salmon fisher is their location! During the late spring and summer, when you see these gulls working above the surface, you know that there will likely be salmon feeding in the immediate area. If there is a kelp bed nearby or, a shallow intertidal flat with a rock shelf or, boulders where small young herring can seek shelter, this is where you can anchor and cast if you are flyfishing or, bucktail or, drift fish with small leaded lures. These specific sites will be determined by baitfish movement and baitfish concentration so be prepared to stay with them when they move. Keep watching the gulls, they will tell you where. 'Coho' gulls and Terns also flag herring or needlefish concentrations, the 'herring' balls formed by active feeding salmon. For the salmon fisher this is exciting hunt-and-chase activity! Gulls concentrating on the surface, both large and small, tell the angler where there is salmon underwater activity. In most cases these herring balls last for only a few minutes and it is important to motor quickly to that specific location so that you can cast to the feeding melee. Be assured, when you have hooked a fast feeding coho or chinook in one of these situations it is an experience to remember! 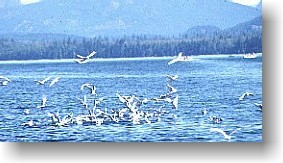 Large gulls, the Glaucous-winged, Herring, California and Thayer's, so common along the B.C. coastline, feed in different ways than the smaller gulls but, each is a signal for the salmon fisher. When I see these large gulls flying high, about a hundred feet in the air, and, in an obvious searching mode, I know they are looking for the smaller panicking schools of baitfish chased to the surface by feeding salmon. Gull activity is one of nature's most important clues for the salmon angler. By their flight patterns they signal salmon feeding behaviour and act as locators for specific salmon fishing sites. Conversely, when you see them preening on a tidal loafing bar you know that inshore salmon feeding activity has been consummated. Gulls are also often found in concentrations on British Columbia's Interior rainbow trout lakes. In fact, in the spring, the Interior lakes act as nesting locations for some species because of the heavy hatches of aquatic insects. The sight of a gull working a small bay in an Interior trout lake is a sure sign that there is a chironomid or sedge hatch occurring in that location. 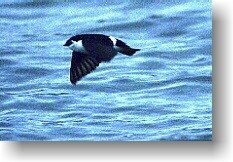 Another bird which is a common sight over freshwater is the swallow. In actual fact, like the many species of gulls, there are many swallow species which help the angler locate feeding trout activity. Over British Columbia lakes four common swallows, the grey slated Cliff swallow, the fork tailed Barn swallow, the white breasted Tree swallow and the iridescent Violet-green swallow can often be found in massive flocks in small concentrated sections of a lake. There is no doubt when you watch their swooping, dipping, diving and mid-air aerobatics that they are feeding on freshly hatched aquatic insects. There can also be no doubt that, under the lake's surface, there will be a concentration of trout also feeding on this surfacing and emerging bounty. Bird concentrations over water bodies are an indispensable wildlife signal. The wise angler heeds all nature's signals to ensure the day will be a success. By observing and learning bird habits and behaviour the sports angler can become more attuned to the many mysteries of fishing for British Columbia's plentiful saltwater salmon and freshwater trout.